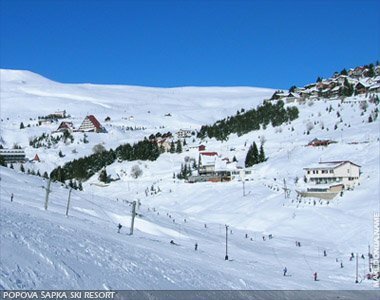 Popova Sapka (Popova Šapka, Popova Shapka) is one of the most famous winter-recreational and ski resorts in Macedonia and the former Yugoslavia. Popova Sapka is located in Sar Planina (mountain). The resort is situated on 18 km from Tetovo and from the capital, Skopje is just 48 km away. Šar Planina itself, is characterized by the numerous natural beauties, large areas covered with grass, flower meadows and 43 peaks at the height over 2,500 meters, above the sea level. The most famous is Titov Vrv - with a height of 2,747 meters, is in the vicinity of Popova Sapka. The beauty of the mountain is enhanced by the several springs and mountain lakes: Livadičko Lake, Crno Lake, Belo Lake, and others. Šar Planina is also rich with woods, that end at 1,600 meters above the sea level. In some of the higher parts of the mountain, the snow remains even during the warmest summer months. The length of this impressive mountain massif extends 80 km, and in latitude - 12 km. The snow cover is from November to April. Popova Sapka is located at the height of 1,708 meters. Popova Sapka is connected to Tetovo, by a cable railway and a asphalt road. In the immediate vicinity of the Dervish Monastery Arabati Baba Tekje, in Tetovo, is the start of a cable car lift going up to Popova Sapka. The lift is 7 km long and it takes less than 40 minutes to reach Popova Sapka. A good asphalt road, that is passing by the mountainous villages of Gajre, Šipkovica and Lisec, leads to Popova Sapka - the complex of hotels and ski slopes, which can be used during the whole year, even in the winter months, (except in very bad snow storms), because the road is always being cleaned from the snow cover. The ski slopes in Popova Sapka are first class. They are connected by chair and drag-lifts. Popova Sapka has 6 ski-lifts: Teteks 1, Teteks 2, Aerodrom, Ge (Pionir), Jelak and one parallel to the Aerodrom ski-lift. 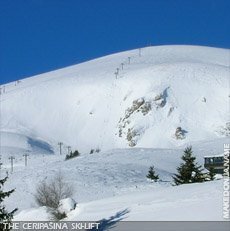 Also there are 3 chairlifts: Ceripašina and one parallel with Teteks and Aerodrom ski-lifts. The third one is by the Ceripašina double chairlift, but it is out of order. 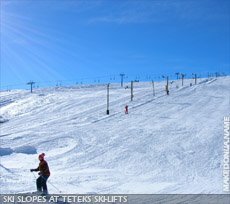 The Teteks ski-lifts are single drag, while all the rest are double drag. 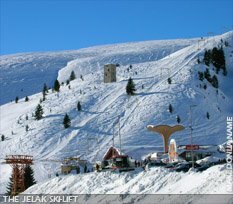 The lowest ski-slope is at Teteks ski-lift 1,708 meters, while the highest is Ceripašina chairlift at 2,510 meters. Just above Ceripašina chairlift is situated the Popova Sapka meteorological station, near the border with Serbia (Kosovo), on an altitude of 2,525 meters above the sea level. 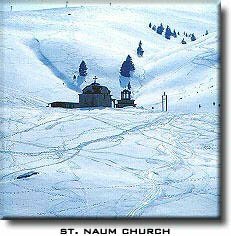 Several years ago a monastery complex was built by the church dedicated to St. Naum. There is a hut at the Ge (Pionir) ski-lift where the visitors can buy some tea or other products. Popova Sapka is a large ski complex. There are many hotels: Inex, Slavija, Teteks, Jelak, Elektrodistribucija - Tetovo, Konak (private) and also around 250-300 weekend cottages opposite the ski-slopes. Every year, on February 15th-16th, the skiing event the "Šarplaninski Cup" is held here. This event was held for the first time in 1947. The best skiers from Macedonia together with foreign participants compete for this cup. Since 1977, the Šarplaninski Cup has been included in the European Ski Association for the competition "EuropeanCup". Popova Sapka ski resort possesses ski slopes, with the total length of 10 km. The total capacity is 8,000 skiers per one hour. On average, the snow at Popova Sapka lasts for 135 days. Available for the visitors are: ski-schools, ski-services and the the hire of ski-equipment. Near Popova Sapka are found the striking localities Jelak, Lešnica and Ceripašina which enhance its attraction as a tourist centre. "Popova Sapka - The End of the cable car lift and the hotel Slavija"
At Ceripašina and Lešnica, the hunting of wild goats has been developed as a sport. Popova Sapka is characterized by a high number of sunny days, clean mountain air and high annual snowfall, which sometimes reaches the depth of 2 meters. During the summer months, Popova Sapka offers conditions for mountaineering, hunting of rare quarry and fishing of the famous šar trout. In the restaurants, the visitors may enjoy the tasty šar specialties, in comfortable and pleasant surroundings.